We believe that there are a number of things all well-designed backpacks for adults should have, like a sizeable compartment for your notebook or laptop, plenty of pockets for holding small items and mesh parts for water bottles. When you compare leather backpacks, styling should also be a concern, as it would be a shame for the natural aesthetics of the material to go to waste by giving it an ugly shape. We’ve considered all of this and more when compiling our list of suggestions below. This is marketed as a laptop-focused product by Amazon but its design is good enough to handle almost any application, from regular school use to nature outings. It features a remarkable number of sections and internal pockets, alongside a padded sleeve intended to cushion sensitive electronics. The main compartment will fit a 17” notebook computer, while the interior of the outermost section is organized with special holding places for mobile phones, calculators, and pens. For outdoors use, there are 2 mesh pockets on the sides which can hold water bottles and other easily accessible supplies. This item might not be as sizeable as the Amazon model but it’s somewhat more discrete, which makes it better fitted for urban use. It has one large main compartment that has been padded to provide better protection for the contents inside. This product can hold a laptop or MacBook of up to 15 inches in relative safety, as it’s also designed to be difficult to access by potential thieves. There’s also a built-in pen pocket and cell phone case, as well as a small hole leading to the computer section which allows a cable to go through for charging. This piece combines style and functionality with an attractive canvas exterior and a lot of compartmentalization. There are two main sections of up to 16.5 inches in height and 11.8 in width, enough to hold a MacBook or other similar devices. The computer gets its own dedicated compartment closest to the back, where it will rest on the back padding and won’t come in contact with other contents. There are also 2 sizeable pockets along its front section, one of them closing with leather straps for an old school look. To give it a little more function for hiking, you also get mesh water bottle holders. Much like similar models, this backpack from Mancro allows for a separate padded compartment for the laptop along the back of the main section, of which there is only one in order to keep it relatively slim for urban use. This product can be secured with its very own combination lock to deter potential miscreants and is big enough to fit a sizeable laptop, at 20” in height. There are a total of 9 inner pockets lining the 3 interior sections, specialized for holding pens, pocket calculators, and other such items, alongside an USB charging port. Made of 100% polyester with a water-repellent finish, this backpack from Under Armour promises to keep your stuff safe from the elements. It also features the usual laptop sleeve inside the main compartment, to keep the screen on the device from touching with the rest of the contents. A shallower compartment can be found at the front, alongside a long pocket for holding small objects such as chargers, mobile phones, or pocket calculators. The bottom is reinforced so it doesn’t scratch as easily when in contact with tarmac or dirt and a mesh pocket lines one of the sides. The Augur Series provides great functionality together with a stylish, vintage look reminiscent of the 1950s military fashion. This unit is mostly made out of thick canvas, and trimmed with cow leather, while metal was used for the various hardware pieces. The closing on the main compartment is made via straps. It is tough and sizeable enough for camping, but it also makes some allowances for urban use, like a padded compartment big enough to fit a 13” tablet, as well as 2 mobile phone interior pockets and various spaces to hold other small items. While not much of a looker, this 40L piece is one of the best-rated rucksacks of its type on retail sites and will serve well during a camping trip. It has 3 spacious compartments lined up by pouches and 2 front pockets, as well as a small section along the wearer’s back which can be filled with extra padding. There’s also a zippered pocket for a laptop or tablet inside the main compartment. It’s made out of high-desnnsity 600D nylon fabric and it allows for the weight to be distributed more evenly with the aid of an adjustable hip belt. The slightly bigger version of the other Under Armour product we’ve looked at, this features the same water-repellent finish for protection against the elements and a reinforced bottom section so it won’t wear down so easily when holding it by your feet. The main section features a soft lined laptop sleeve so the screen won’t scratch by rubbing against other items in your inventory and a number of pockets to hold on to small items. The straps have quite a lot of padding, for which a plastic material was used to provide better thermal comfort than regular foam. Are you looking for a backpack for men? You should know that picking the right one can be a bit of hassle if you don’t have a clear set of requirements from the outset. Men can be very particular about what they need in a backpack, and, in case you are looking for the perfect gift for your boyfriend or husband, this buying guide will help you out. Also, if you are a guy on the hunt for the best male backpacks, you will find many useful pointers in our guide. The thing with backpacks is that they seem an awful lot of them available for sale on the market and that can prove troublesome if you don’t have a lot of time on your hands. Don’t worry; we did our homework, and now we can safely recommend you some great ideas to get you started. You don’t have to waste precious time and effort on choosing the right backpack, as long as we took care of all the research and you can easily pick the best model from the broad range of models available. Now you only need to think about the trip you want to plan next. Choosing the right backpack for guys may seem challenging at first, but the truth is that you only need to keep a few important things in mind. We aggregated the results of our research and boiled them down to several essential pointers. As long as you keep all these matters in mind, you will make a perfect choice. When we’re talking about trip length, we immediately think of the capacity of the backpack. The safest rule is always to consider the size of the backpack while thinking of how many days you will be away from home. With so many things to keep close to you when on trips, you have to be organized and ready to go at any moment. For a weekend getaway, your backpack should have a capacity of 30-50 liters. This is a way of keeping things light, without forgetting anything at home. However, when you pack light, you need to bear in mind that good organization takes you a long way. The best reward is that you will not have to hike a heavy backpack after you, as long as you know how to travel light. For trips that extend over almost one week, a larger backpack would be a better choice. 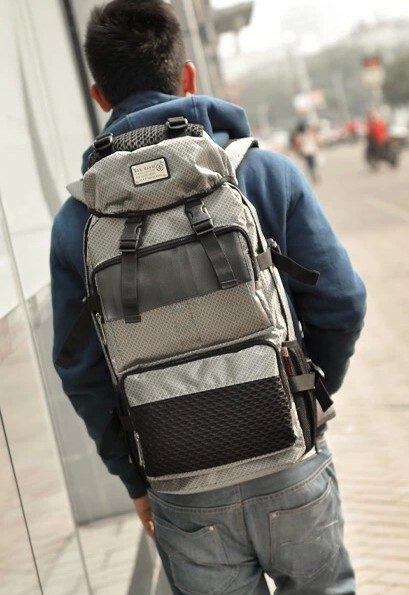 Aim for cool backpacks for men with a capacity of 50-80 liters, because you will have to pack some luggage to take along with you on such trips. The advantage of having a larger backpack is that you can take it with you on shorter trips, as well. For longer trips, you should aim for the largest available. Men prefer having enough room for everything they plan to take on trips with them, which is why larger models are the most indicated in case you are shopping for a guy. Winter travels, in particular, are demanding, since you will need warm clothes and even an extra blanket that takes up a lot of space. Think about getting a backpack with a higher capacity than 70 liters. When talking about support, we’re referring to two important things: suspension type and straps. 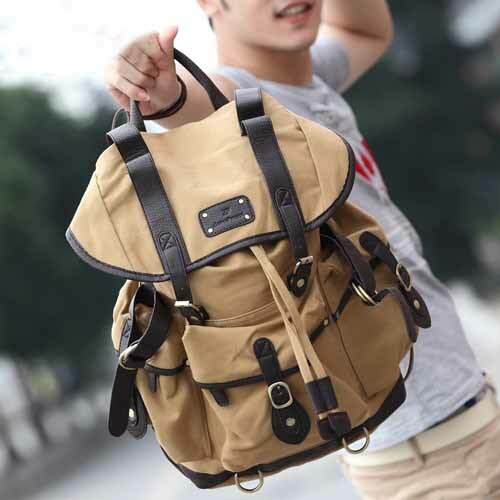 Cool men’s backpacks must offer you the possibility to carry a lot of weight while providing you proper comfort. The weight should never be supported just by one part of your body, so your backpack should have a precise setup. Your hip belt is essential. When you carry a lot of weight, about 80% of the entire weight is supported by the hip belt. This must go around your hips, but provide a rigid support without chafing your skin. Some padding in this area is also essential, for the same reason. Next, take a look at the shoulder straps. The curve of the straps must take the anatomical shape of your body. You should not necessarily choose thick padding for the shoulder straps since you now know that most of the weight is supported by the hip belt. Make sure that the shoulder straps are easy to adjust, for maximum comfort. Guys always appreciate having equipment that keeps them prepare for any situation. They are very careful with the gear they pick, so, if you are buying a backpack for men as a gift, this is something to keep in mind. Certain features are more important than others, and you should focus on them more than anything else. The frame type matters as it has to do with the kind of luggage you want to carry around. Internal structure models offer excellent support and make sure that your shoulders will not have to support most of the weight. External frame models are a better choice if you carry things that can be mounted externally, such as an inflatable boat. There are also frameless models that are light and comfortable on your back. These models are excellent for climbers. They also provide proper ventilation, which is another important feature we should talk about. Some airflow should be ensured by the construction of the backpack. Make sure that your backpack allows easy access to the contents. Top-loading models are widespread, and the rule to follow is simple: the last items to be used should go first inside. A front panel with a zipper is ideal for quick access to the most necessary items. A lot of pockets don’t hurt either. While there can be many things to talk about backpacks, let’s not ignore the importance of a good fit. Here are a few things to keep in mind. The torso range of the pack should fit your torso length, or else you will end up either supporting the backpack on your hips more than you should or having to deal with a small backpack that is uncomfortable. The hip belt should go around you, and sit on top of your hips, while the shoulder straps should have the anatomically correct shape to avoid discomfort. The padding used for these straps should not go further than 2-3 inches below your armpits. This is how a perfect fit should look like.